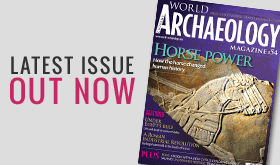 Our cover is inspired by this summer’s exhibition at the British Museum, which prompted Chris Catling to examine the vital role horse power played in more than 6,000 years of human history. He discovered, surprisingly, that it all began with the humble donkey. Past study of Ancient Egypt often concentrated on the examination of monumental structures and interpretation of hieroglyphs. As a result, we know much about the ruling elite. But what about their subjects? At Amara West inSudan, the local Nubian population adapted to the culture of their overlords in Egypt while still maintaining their own traditions, both in life and – through their burial practices – in death. Here, archaeologists are discovering what life was like for the ordinary citizen through excavation of their homes and examination of their skeletal remains. The result is a comprehensive picture of everyday life in a Nubian town under Egypt’s rule. Scattered across the desert floor of Namibia are discarded handaxes that date to the Lower Palaeolithic, lying exactly where they were dropped by their Early Stone Age owners. Most extraordinary is the so-called ‘mandolin’, a huge handaxe, named for its strange shape. Its purpose remains a mystery, but it was certainly part of the Acheulian toolkit. A multicultural society thrived for generations at Dascyleum, in Anatolia, once home to Croesus, the Lydian king of legendary wealth. Recent excavations revealed burned layers and evidence of destruction, attesting to a violent takeover by the Persian army under the command of Cyrus the Great. Yet, the city survived to become the prosperous capital of the newly formed satrapy. Our News Focus is on Syria, a country in crisis where the conflict is also taking its toll on the nation’s rich cultural heritage. I warn you, this makes for grim reading. In our Special Report, Sean Kingsley tackles another critical issue: the terrible plight of our underwater heritage that daily faces the devastating effects of fishing-trawlers’ nets. While who should or should not be excavating these shipwrecks is a debate for another time, the issue here is the very urgent need to halt the destruction modern technology wreaks on such fragile remains.